Rep. Cathy Muñoz (R- Juneau) will reintroduce a bill this legislative session to make discrimination based on sexual orientation illegal. Juneau Republican Rep. Cathy Munoz (left). 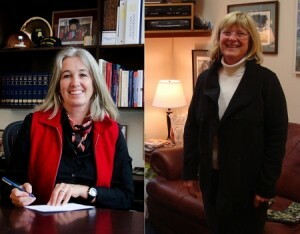 Former Juneau Democratic Rep. Beth Kerttula (right). Former Juneau Rep. Beth Kerttula, a Democrat, introduced the same bill in 2011 and then again in 2013. Muñoz cosponsored the bill in 2013. She says she hopes the bill will hold more weight this time with her majority Republican colleagues. Kerttula first introduced the bill a year before Anchorage residents voted against adding sexual orientation to the municipality’s anti-discrimination laws. The 2015 legislative session begins Jan. 20. Lawmakers’ pre-filed bills will be released over the next two weeks.